With the rapid evolution of multimedia communications, engineers and other professionals are generally forced to hoard a plethora of different texts and journals to maintain a solid grasp on essential ideas and techniques in the field. Wireless Multimedia Communications provides researchers and students with a primary reference to help readers take maximum advantage of current systems and uncover opportunities to propose new and novel protocols, applications, and services. 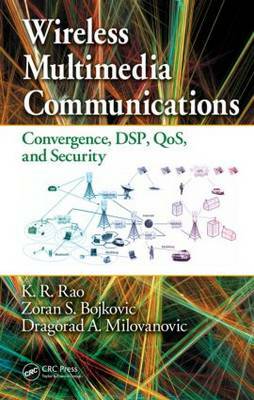 A complete technical reference, the text condenses the essential topics of core wireless multimedia communication technologies, convergence, QoS, and security that apply to everything from networking to communications systems, signal processing, and security. From extensive existing literature, the authors distill the central tenets and primary methods of analysis, design, and implementation, to reflect the latest technologies and architectural concepts. The book addresses emerging challenges to inform the system standardization process and help engineers combat the high error rates and stringent delay constraints that remain a significant challenge to various applications and services. The authors identify causes of information loss in point-to-point signal transmission through wireless channels, and then they discuss techniques to minimize that loss. They use examples that illustrate the differences in implementing various systems, ranging from cellular voice telephony to wireless Internet access. Each chapter has been carefully organized with the latest information to serve dual purposes as an easy-to-reference guide for professionals and as a principal text for senior-level university students.